So - when I went to eagerly fetch my award - you know I did! :) I went to (dutifully) check out where Tara got hers.... and I swear I saw my Loves Julie, Evie, and Laura there. So I kept them off my list! But - someway, somehow my dearest Evie has been omitted - ?? ?- and so I am swooping her up right quickly before someone else does and adding her to mine! 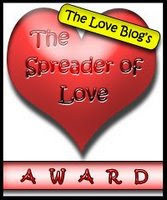 As with all the others - I give this award because I believe love makes the world go 'round, and Evie certainly does her part joyfully and well! Mucho Loves to you, Evie. I really, really, appreciate your kindness and friendship. Mucho love to you, too my sweet, dear friend. Just so you know, I feel so blessed to have met you. I'm feeling a little misty because they're putting me under for my surgery tomorrow and I have this fear of not waking up! If I don't, I just want you to know that I think you're one of the most awesome people I've met. You always challenge my conventional thinking and jar me into reflecting upon my own status quo. You're gentle, kind, sparkly, and full of life's magic. Thank you for being my friend these many months. It has meant SO much to me!